Now living in: Wilmington, Del. "I selected David after seeing him perform work at various venues around the city. His professionalism, self confidence, ability to withstand pressure and follow through on commitments made him stand out. Also, the character and values instilled in him by Point Park University show through in his every move. He executes his work with purpose and is driven toward the goals at hand." "The faculty and staff at Point Park are great and Pittsburgh is an awesome city. I got opportunities I never would have at other schools." How did you land your position with the Philadelphia Eagles? 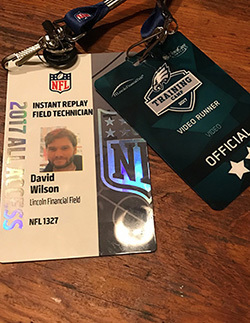 A good friend of mine leads the instant replay technician booth for the Philadelphia Eagles and offered me the position. He knew my work background with Live Nation and World Café Live and that I had experience working at big events. Tell us why the SAEM program was a perfect fit for you as a transfer student. The SAEM program is really, really awesome. It's the only program I could find that had sports, concert promotion and theatre arts management all rolled into one. With the Cultural District within walking distance to campus, and both stadiums across the river, Pittsburgh is the perfect place to have this type of program. Professor Ed Traversari hooked me up with tons of opportunities to work at shows through Live Nation and Drusky Entertainment. Also, it was great as a musician to work at these because I met many concert promoters and got opportunities to play at some cool shows. I also learned a lot about marketing and social media in my classes with Professor Paige Beal and how to read business contracts with a fine-tooth comb in my Business Law class with Professor Steve Tanzilli. Also, I got great exposure to the sports industry in the Media Relations in Sports class taught by Tom McMillan and Jennifer Bullano Ridgley from the Pittsburgh Penguins. In what ways did Point Park prepare you professionally? What I learned in the classroom, I was able to apply at my internships. I have a really good handle on the ways the sports and entertainment industries work. Also, I have a degree that says I learned from the best concert promoter in Pittsburgh (Ed Traversari) so that's been really helpful. The faculty and staff at Point Park are great and Pittsburgh is an awesome city. I got opportunities I never would have at other schools. What advice do you have for our students looking to work in the sports field? Say yes to every opportunity that you can even if it doesn't sound glamorous. Being a concert runner involves long hours for not a whole lot of money, but the experience you get from it is totally awesome. I still have long hours in my current job, but the payoff is really rewarding. I get to stand on the sidelines of every Eagles game with over 69,000 people in the stadium. It's worth the hard work. My goals are to continue playing music and working on the production side of large sporting events and concerts. Through Professor Traversari's connections with Live Nation, I got to be a production assistant at the 2009 NFL Kick-off game concert at Heinz Field with Tim McGraw and the Black Eyed Peas. I knew I was in the right place when I got an opportunity like this during my first week at Point Park. For the next three and a half years after that, I continued to take advantage of every opportunity I could.